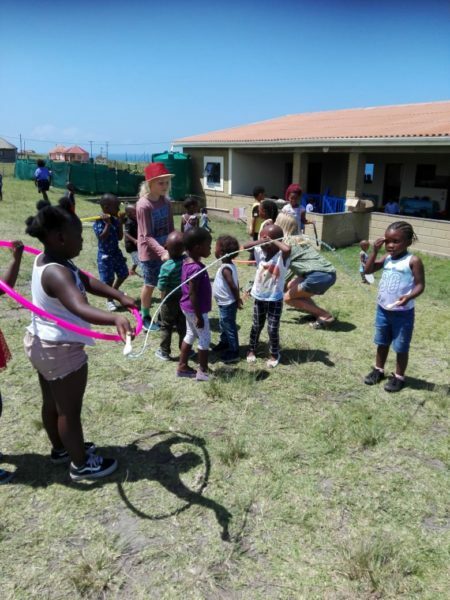 Find out what the House of Children have been up to so far this year. We had another busy start to the year and were privileged to have had quite a few people visiting our school during this term. Firstly, a young couple, Lisa who works at an orphanage in Germany and her husband Max. 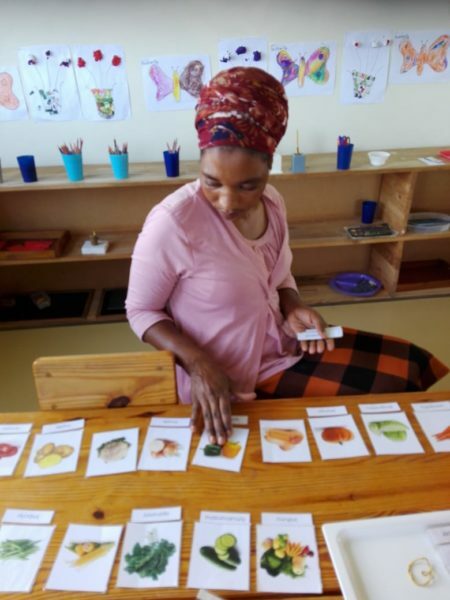 I could see her love for children was displayed when she was observing the learning environment. Maurits from Holland is visiting Coffee Bay for four months. He brought us some stationary and story books for the children. A special thanks to him for taking time off to come and volunteer at Sustainable Coffee Bay. PS. We are re-designing our website! Watch this space! Henrik and Johanna (with their 3 daughters) also visited us from Scandinavia. 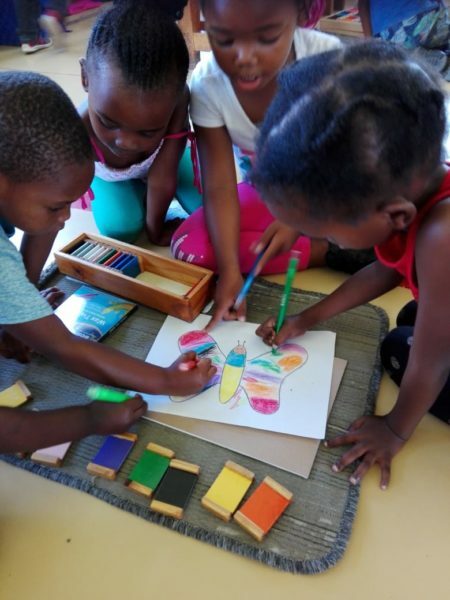 All of their children have attended Montessori school as well so they were delighted to see some familiar learning materials. 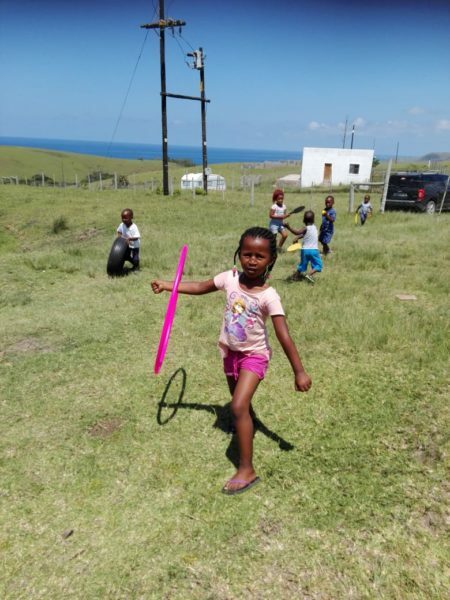 During dedicated playtime, the whole family joined in when the children used some of their new hoops, balls and skipping ropes. It is so good to see people join in with the children when they visit without disturbing the learning environment. This term we learnt about butterflies. 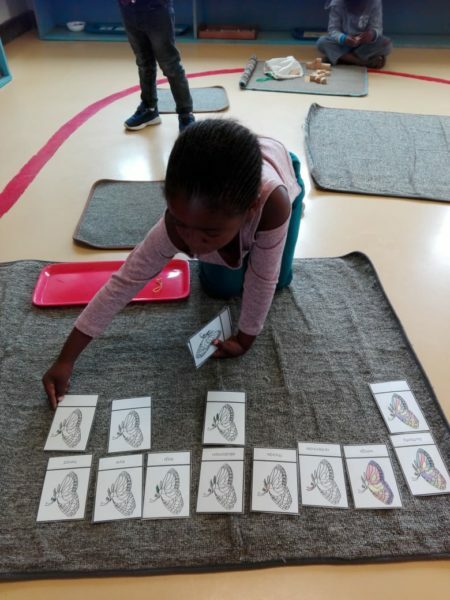 The children learnt the different body parts and characteristics of an insect by using the butterfly nomenclature (matching) cards. They also used cards with the butterfly’s life cycle. Children found fresh flowers where we could learn about butterflies eating the nectar and pollination. 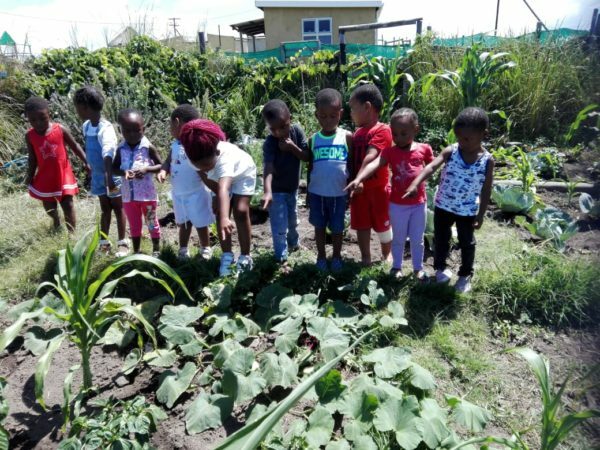 We also went to look in our garden to see what damage a caterpillar can do to vegetables, munching away at the soft leaves. 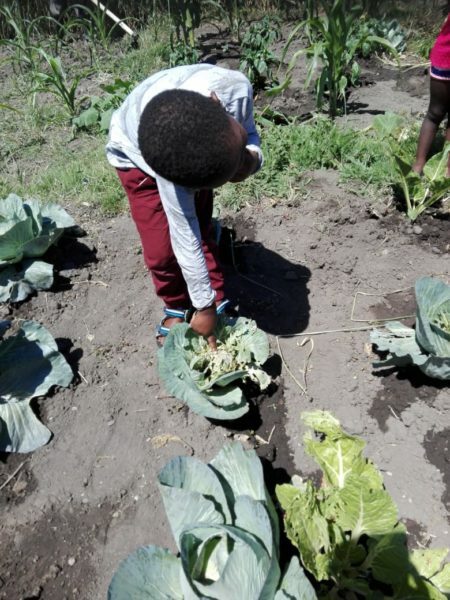 One of the cabbages was badly damaged by caterpillars but our mealies, butternuts and green peppers were left unharmed! We welcomed young new learners at the start of the year. One of the last newbies to start with us is a little girl of almost 3 years. Since the first day she arrived, she would run away and cry when she sees me. Most of the children are a little wary of me because I look different to their parents, but this one was the ultimate. About 3 weeks down the line, she started opening up and smiling from a distance. One day as visitors arrived she ran towards me and grabbed onto my trousers. I knew then the ice was broken. I now get a wave from the chair she sits in while working and I get the opportunity to show her how the equipment works. On another occasion, when we first started speaking about the butterfly, a hand in the class was raised and a little voice said, “A butterfly comes from a caterpillar” in the purest of English. This was one of the pre-schoolers who remembered a story which I read to them towards the end of last year where the caterpillar was so tired of waiting to turn into a butterfly. Look! Our butternuts are growing! Our parent workshop was again well attended with parents actively taking part in discussions and presenting from their side. A cooked meal, donated cool drink and a lucky draw were offered as a bonus to the parents. Mr Silevu was the lucky draw winner of a R300 shopping voucher to share with his family. A special thank you to Coffee Shack for donating the voucher. Other highlights this term include a new gate that is up now at the entrance of the property. It looks very neat and works much better than the previous “worn out” one. Some of our learning equipment has been repaired and painted and we also have a very neat bookshelf for our book corner. Along with new practical life equipment, we have really brightened up our learning environment. Thanks to the maintenance team at Coffee Shack for all their work! How do we greet each other in Xhosa? Unjani? – How are you? Ndiphilile. Wena unjani? – I am fine. How are you? Nam ndiphilile – I am also fine. 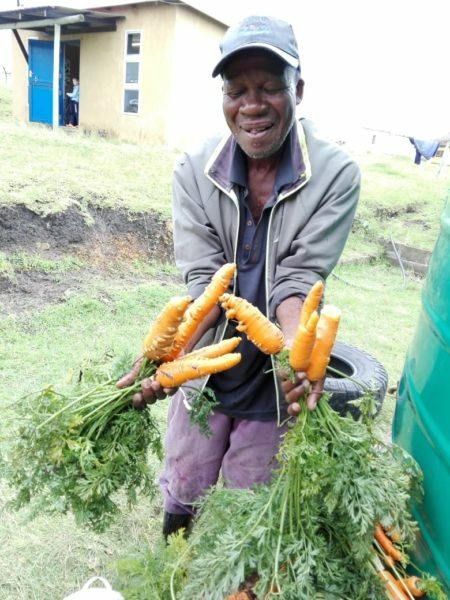 Music with a crop of carrots for the children! Children growing up in poverty face difficult challenges to meet even the most basic needs like access to quality education and health services. Help us change that by sponsoring a child today! That great feel-good factor for sponsoring a child in need! We can also provide a tax deductible receipt (for South African residents only) and the option to pay via PayPal for overseas sponsors. Contact us for more details on how you can get involved. 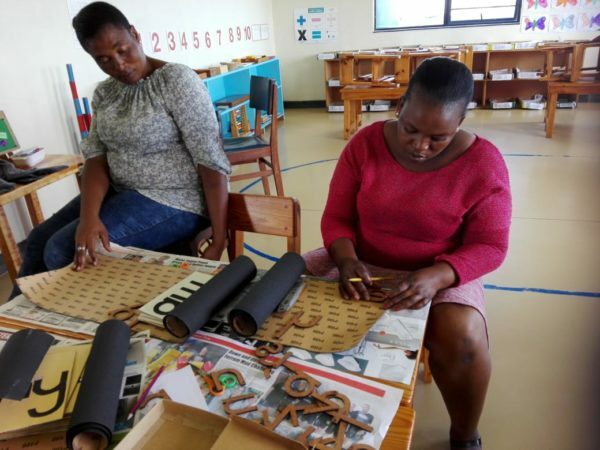 Nonzame (new Assistant) and Fundi making Montessori materials. If you, or anyone you know might be able to help, please get in touch! If you are planning on visiting Coffee Bay, let us know so you can also be #morethanavisitor ! 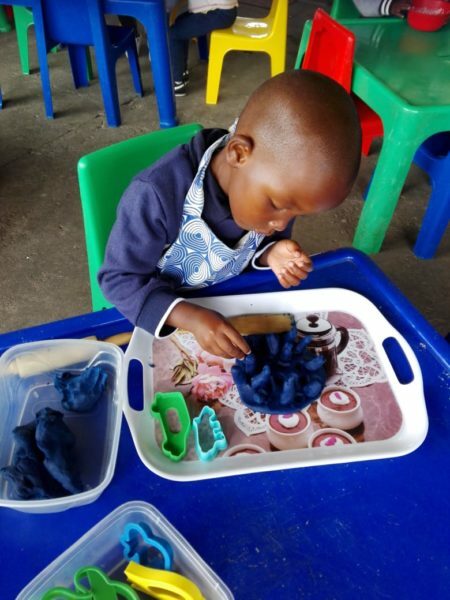 • 18 sponsors for our pre-school children at Ikhaya Labantwana Montessori. • Desktop or Laptop computer, to replace our 2011 model that is on its last legs! With love and thanks to our community of supporters.